More than three years ago, I was asked to pack my bags and relocate to Addis Ababa. I was to accompany my husband who had then received a job posting with an international humanitarian organisation in Ethiopia. I remember feeling elated but above all, I was filled with such great expectations. It was the first time I was to set foot in East Africa, a land which has inspired great explorers, writers, photographers, artists, movie makers and environmentalists. It is also a land which inspired me since I was a little girl. For the first time after three years since Afghanistan, my soul was stirred yet again as I prepared to travel to another unknown world, one which I could previously see only on television screens or read from paperbacks. My mind took me to places where the legendary Dian Fossey once made the first ever recorded peaceful human contact with the mountain gorillas of Rwanda and the mystical peace and tranquillity of Mount Kilimanjaro as described so vividly by Hemingway. I remember sighing with sheer pleasure and awe as I watched the breathtaking cinematography of Sydney Pollack in Out of Africa where Karen Blixen made her unforgettable journey on air over the Ngong Hills to Mombasa. She had apparently said, “Yes, I see. This is the way it was intended.” And now, it was my turn to see how it was intended to be. I couldn’t help but dwell in mental images of ubiquitous savannah where herds of African elephants with their magnificent ears, marching gracefully in a single file and zebras, each with their uniquely patented stripes, grazing under the watchful gaze of mighty predators. I even fantasised about hopping up and down with the Masai Mara, as seen in “your local bank” advertisement. Such was my impression of Africa. Unfortunately, I was quick to learn that Ethiopia is unlike many of its African neighbours. For many people who bear very little knowledge of this country, nestled in the Horn of Africa, it is probably best known for three things; the great famine during the 1980s, middle distance and marathon runners and the discovery of Lucy, the oldest bipedal human species to walk the world 3.2 million years ago. That was the little knowledge I had brought with me to Ethiopia. I soon understand that Ethiopia, formerly known as Abyssinia, is rather unique in terms of its socio-cultural practices, which sets her apart from her other African sisters. I began to comprehend what the locals meant when they adamantly insisted that Ethiopia is not Africa, in which I had often responded with a sinister look. Now, I am willing to accept that what would make Ethiopia “African” is purely geographical in nature, just like Egypt, Tunisia and Morocco. Needless to say, it also means that Ethiopian calendar is seven and a half years behind our commonly used Gregorian calendar. The millennium was celebrated with much pomp and circumstance in 2007 as Ethiopians ushered in the twenty-first century, albeit the huge global Y2K hullabaloo seven years ago. Learning to tell the local time is also a practise in need of getting used to. 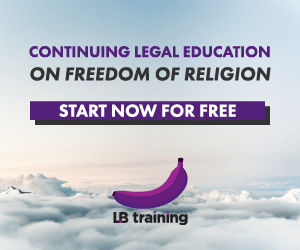 For example, according to Ethiopian time, it is six hours behind our ordinary comprehension of time, which often generates confusion to the unfamiliar when making appointments with the locals. This is due to the fact that while we start our morning at 6a.m. they start theirs at 12p.m. So if the plumber agrees to repair your clogged toilet first thing in the morning at two o’clock, do not get into a fury because it only means eight in the morning! Ethiopians are essentially proud people, mainly rooted in the fact that it is the only African country that has defied foreign colonialism. It is also a country that is steeped in its own history, civilisation, legend, tradition and culture. Whether some of the mystical legends bear any truth to it, they still serve as a unique source of national pride, both filled with charm and intrigue. History has revealed that in 400BC, there was an ancient great civilisation called the Aksumite Kingdom situated in the north of Ethiopia. Once a powerful empire, having stronghold on the commercial crossroad of the Red Sea, it rose to great prosperity and fame from international trade with Egypt, Syria, Italy and India. Local legend has it that Aksum was once Queen of Sheba’s capital in the 1000BC. It also believes that Emperor Menelik, whose dynasty would eventually reign in Ethiopia for the next 3,000 years, was the son of King Solomon, conceived with Queen of Sheba on her visit to Israel. Menelik, then returned to Jerusalem to visit his father, had stolen the Ark of the Covenant to be returned to Ethiopia. It is believed that the Ark of the Covenant now sits in Aksum’s St. Mary of Zion church. Although visitors are forbidden to sneak a peek at the covenant, many faithful Ethiopians continue to believe its existence today. 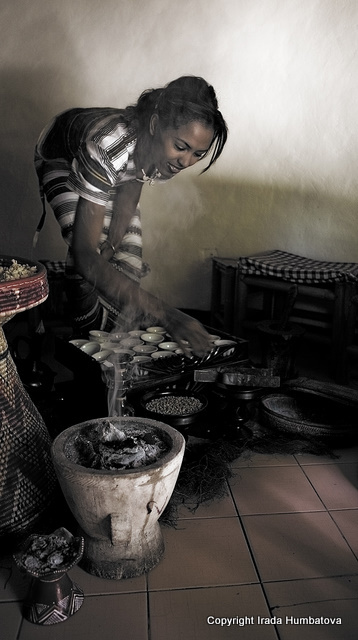 Ethiopian coffee ceremony - a woman serving coffee in true traditional Ethiopian fashion in Addis Ababa. While we could never truly unravel the legitimacy of this legend for now, we do however know that coffee originated from Ethiopia which holds very good reason why coffee ceremonies are held in such high esteem here. I, for one, have stopped drinking instant coffee ever since I had my first cup of Ethiopian coffee. It is really the best! In terms of nature and wildlife, Kenya and Tanzania may be the preferred destinations for safari and national parks; Ethiopia is an ornithologist’s dream as it is the habitat of eight out of ten endemic birds of Africa. It is also the home to the endemic Gelada Baboon, Ethiopian wolf, and the Mountain Nyala. The other aspect of Ethiopia’s uniqueness is the Ethiopians themselves. Ethiopian beauty is no stranger to many people especially those who are fashion savvy. Gracing the covers of many top fashion magazines and Paris and New York haute couture catwalks is Ethiopian supermodel Liya Kebede and she is not the only Ethiopian woman blessed with such good looks, bone structure and physique. Ethiopians do have a different genetic makeup from the rest of Africa, with the exception of some Eastern African countries like Somalia and Sudan. They have lighter skin tones, higher cheek bones, finer facial features and often lanky. 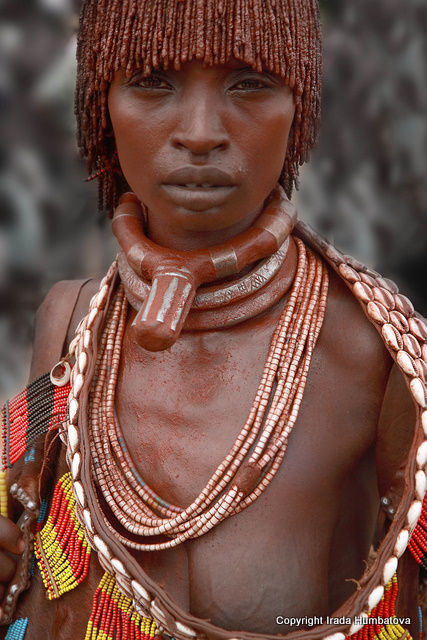 This does not mean that Ethiopian women take their looks for granted. In Addis Ababa itself, it is easy to spot hair and beauty parlours even in the most remote of alleys where local women sit religiously for hours maintaining or changing their often intricate hairstyles on a weekly basis. Next week: Part II – The faces, sound and smell of Addis Ababa and how a second tai-tai with her photo camera and assortment of lens come into the picture. Irada Humbatova was born in Azerbaijan’s capital Baku on 12 July 1974. She trained and worked as a midwife from 1994 to 1997, later assisting the International Federation of the Red Cross/Red Crescent with maternal health work by training and supporting traditional birth attendants in rural areas. Since then she has followed her husband on Red Cross missions around the world, developing her love for photography into a passion and profession. 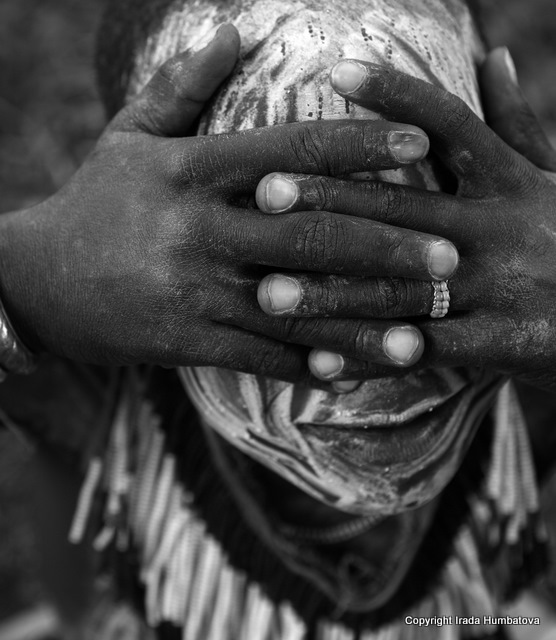 Inspired by Africa’s immense beauty and its people’s suffering she moved from art photography to photojournalism. She has since grown to become Reuters’ stringer for Ethiopia and work on assignments for other news outlets and magazines. Irada is currently back in Baku continuing her work with Reuters. Posted on 26 November 2010. You can follow any responses to this entry through the RSS 2.0. This is a decent post. This post gives really quality data. I'm certainly going to investigate it. Truly extremely helpful tips are given here. Much obliged to you to such an extent. Keep up the acts of kindness. I just realised that the writer is oriental it's really like me saying that somehow one oriental country is not really oriental or doesn't share anything with the next oriental country whatever just because they happen to be taller or their eyes are more open etc, things that this article would consider to be more appealing to westerners. Just because their physic is different from other African countries does not mean they are not African. This article is some how implying just because they have characteristics which match westerners such as high cheek bones, skinny etc they are somehow more closer to white westerners which is not true. Black ppl all around the world look different, the same white ppl look different. If I took Russian women and compared them to American or British woman or if you consider Spanish women and Italian women white then they would all look different from one another. It’s like take Bjork some Icelandic brunettes can look a bit chinese. And really by saying it’s not really Africa this article is saying that somehow “Africa” is a bad place. And only idiots think that Africa is about long distance runners and nice parks whatever. Like Nigeria has given birth to some of the most talented and gifted writers, musicians etc. And just because they have what some people might consider many beautiful women I don’t go around saying oh Russians are somehow different from other white countries because ppl consider there to much more beautiful women there then say Ireland or something. Plus every country probably has something unique to them and Ethiopio definitely shares alot more in common with other “Afrian” countries that this article has blantantly pegged as being inferior than those countries you’re somehow holding up as better. I'm amazed. I never knew any of this about Ethiopia – my only visual representation is the picture of the starving kid in We are the World music videos. Thanks Ka Ea and Irada for this brilliant piece, and for sharing it with us here. Looking forward to the next instalment. Sadly, that’s what most people know about Ethiopia (and not forgetting its long distance runners!). I think Irada took to the country quickly while it took me longer to get used to many things. But in the end, I didn’t want to leave!